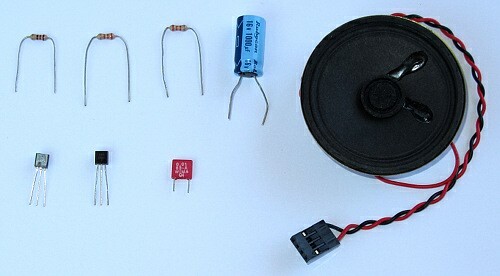 Read about NPN transistors, PNP transistors and loudspeakers. Breadboard, wire links, battery and battery clip. 1 100n capacitor (0.1uF) C2 Non-polarized. 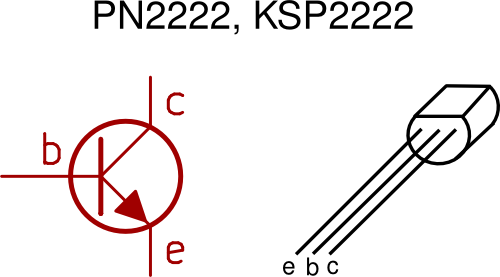 Two new symbols are introduced in this circuit diagram – the PNP transistor and loudspeaker. Insert the 33k resistors: Connect R1 from the top rail to a tie point in the board below. Connect R2 to R1 and to a tie point to the right. Get the 1000uF capacitor and a wire link ready. 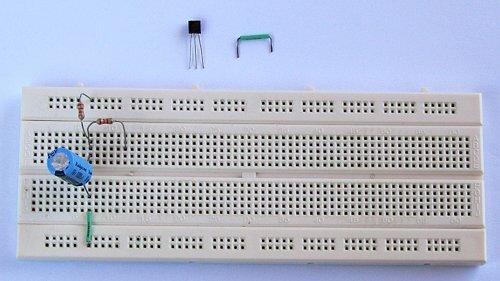 Connect the positive lead of the 1000uF capacitor (C1) to the vertical breadboard strip that connects R1 and R2. Connect the negative lead to the bottom rail through a wire link. One capacitor lead must be above the middle channel of the breadboard and the other lead below it. 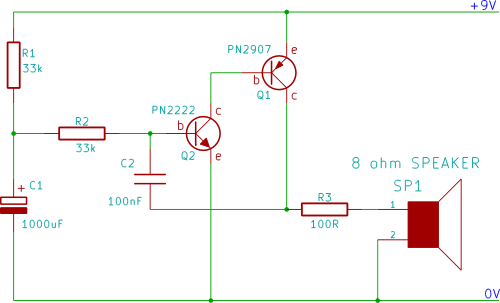 Get the PN2222 NPN transistor (Q2) and a wire link ready. 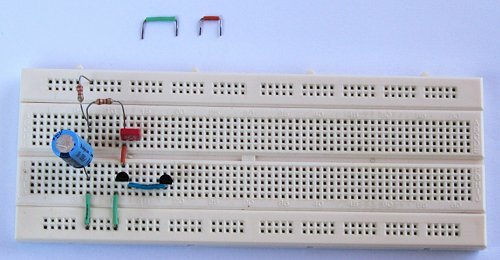 With the flat face of Q2 towards the bottom rail of the breadboard, insert the transistor so that its middle lead (base) lines up with the right lead of R2 above it. 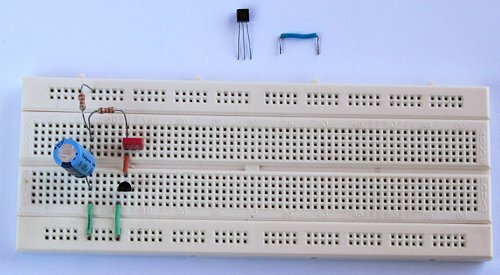 Connect the left lead (emitter) to the bottom breadboard rail using a wire link. Get the 100n (0.01uF) capacitor (C2) and a wire link ready. 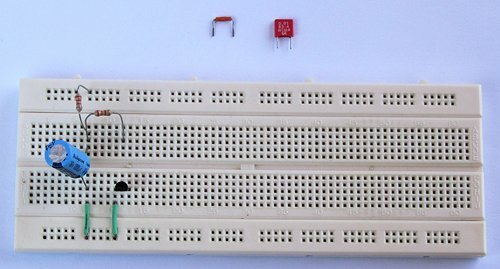 Connect the middle lead of transistor Q2 to R2 by inserting a wire link across the middle breadboard channel. Plug one lead of C2 into the same vertical connecting strip where R2 and the link that was just inserted join. The other lead of C2 must be positioned to the right of this connection. 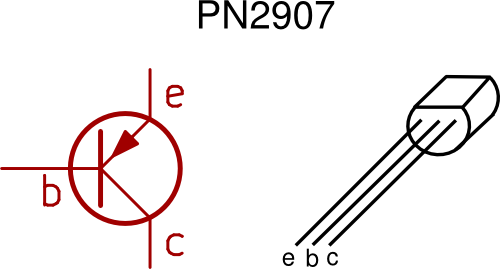 Get the PN2907 PNP transistor (Q1) and a wire link ready. Insert a wire link so that it connects the right pin of Q2 (collector) to a tie point to the right. Insert Q1 so that its middle pin (base) connects to the other end of the wire link that was just inserted. Make sure that the flat face of Q1 is pointing to the bottom rail. Using two wire links, connect the emitter of Q1 to the top rail of the breadboard. Using two wire links, connect the collector of Q1 (right pin) to the unconnected lead of C2. Get R3 ready (100 or 120 ohm resistor). Connect one lead of R3 to the collector of Q1 (right lead) and the other to a tie point to the right. Get the loudspeaker and two wire links ready. Connect the positive lead of the loudspeaker to the right lead of R3. 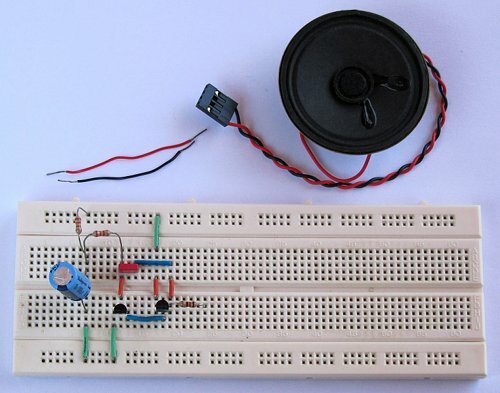 Connect the negative lead of the loudspeaker to the bottom rail of the breadboard. 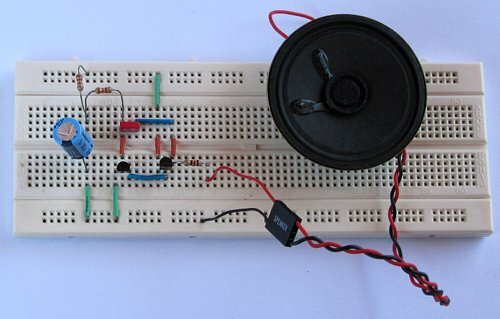 Two wire links are used to connect the loudspeaker to the breadboard here. If your loudspeaker does not have a connector then just plug the loudspeaker wires directly into the board. 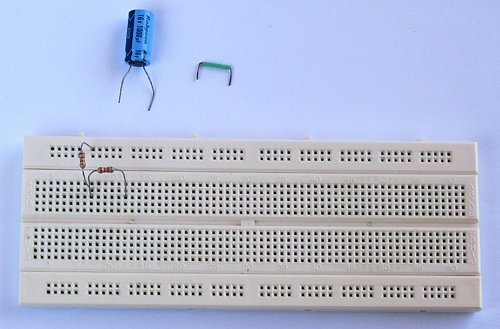 Connect the negative lead of the 9V battery to the bottom rail of the breadboard. 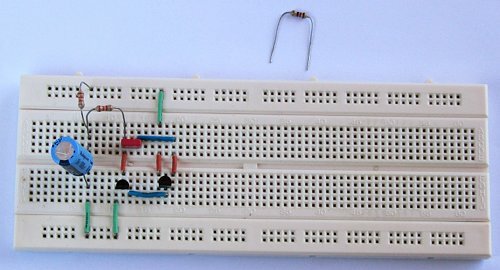 Connect the positive lead of the battery to the top rail of the breadboard to complete the circuit. After connecting the battery, the loudspeaker will produce an audible rising pitch. When the pitch reaches its peak, the sound will stop. To produce the sound again, remove the positive lead of the battery for a while and then plug it in again. If the siren does not make a sound, then try leaving the positive lead unplugged for a while longer before connecting it again.